One of my better friends, Thakur, who is an English teacher, was sharing his bittersweet experiences with me the other day. He complained of his meager salary despite working for nearly ten hours a day, teaching in different schools and colleges. The money spent on food, rent and other essentials consumes the bulk of his meagre salary. “I have not given up the big dreams I left my village with,” he recalled. He had come to Kathmandu in search of better opportunities. His plight reminds me of life’s endless frustrations that come with increasing responsibilities as one grows up. My friend sometimes abhors his profession. But he has found some satisfaction in his calling. “The students give me great respect. There is nothing more precious than this. That, in turn, builds a strong bond between us.” Nevertheless, most of the times, he wants to leave everything and hunt for greener pastures abroad. My friend keeps changing his mind. He wants to do so many things but cannot make up his mind while burdened with all the responsibilities that he has to shoulder. He never tires of blaming the government for not being able to respond to the people’s aspirations expressed through the recent Jana Andolan II. He holds corruption, groupism, and sycophancy responsible for most of the ills the nation is suffering from. With his constant tirades against nearly everything under the sun, Thakur reminds me of a character, Krishna, in RK Narayan’s novel, The English Teacher, in many ways. The desolate character frets endlessly over his life. At thirty, he resolves to cease to live like a cow, but is continually bereft of the feeling of a great chasm in his life. 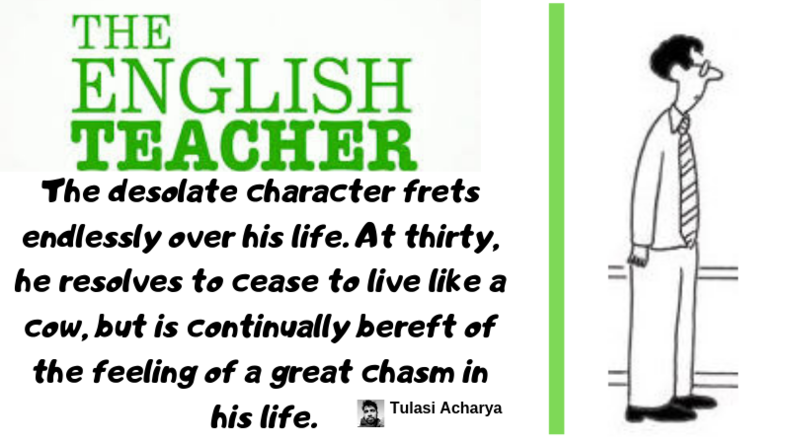 Note: Currently, Thakur lives in Canada with his wife and two daughters, and I live in the USA, teaching English part time.